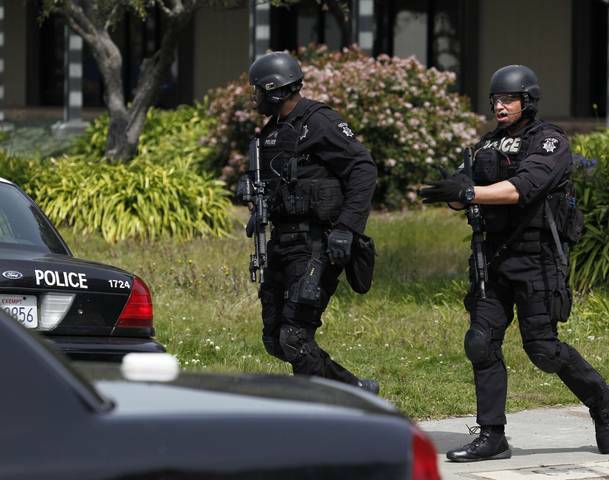 Seven people were killed and three injured on Monday when a former student went on a shooting spree on a Calif. campus at a small Christian college in Oakland. Paul Singh, whose sister was injured, told Reuters that the shooter ordered students: “Get in line and I’m going to kill you all,” reported the Los Angeles Times. Students ran out of the building while emergency workers ran into the Christian school carrying bodies out and covering them with tarps. A manhunt went into immediate effect with SWAT teams on the ground at Oikos University. Just an hour later, just down the road, the gunman told grocery store employees, “I just shot people.” The suspect was later identified as a former nursing school student. The Asian man is a 43-year-old, named One Goh, of Oakland. Goh’s school shooting was carried out with a .45-caliber handgun, where witnesses say he came in, sprayed the room with bullets, and ran out. Although the investigation is still ongoing, a source told The San Francisco Chronicle that Goh was in a disagreement with campus officials, and may have been kicked out of one of his classes. Students in one room heard a receptionist scream, “Jesus Christ, Jesus Christ, he’s got a gun,” while they stayed locked in their classroom where the gunman first attempted to enter by kicking it, but instead shot four bullets and went on. Students in the classroom refused to answer the door even when police ordered them to open it because they thought it was the gunman of the school shooting trying to trick them.